Are you tired of remembering your coworkers' names while celebrating their birthdays? Do you just want cake in the break room without all the fuss of that "personal touch?" Then welcome to the Cakes of the Month, where (for an annual fee) we provide your workplace with generic monthly treats suitable for all your office birthdays! And just look how gorgeous! We do not charge for inscriptions*. Period. Should you do something special for your spiritual coworkers? Is a Gemini lonely when its Taurus Moon is in retrograde?!? Daily Horoscope says: "Today, you will be visited by unnecessary sprinkles and apostrophes." But what about the taste, you ask? Why, our cakes are so delicious, you may just foam at the mouth! One bite of our infectious confections, and you'll go crazy for more! And for the manager who can't be bothered to remember what month it is, we have the perfect* solution! Complimentary memberships* go out to Adrienne B., Paula C., Arwen L., Gloria D., and Brittany A. Too bad about the rabies cake. It could have been the best looking one of the bunch if it didn't have that foam filling! Man, as someone who used to have to order the monthly cake, you do NOT want to go down the path of putting everyone's name on it. There's always that one paranoid jerkwad who demands his birthday be taken out of the birthday roster, but then whines when his name isn't on the cake. I even stopped putting the month on there. "Happy Birthday, Whoever" was not only appropriate in content but in apathetic tone. These totally cracked me up! Hah - an extra charge for making up months... like the ever creative "Febrary." Oh, and A Birlhday for Everbody has the makings of the newest installation of "Festivus for the Rest of Us" Costanza would be proud! Oh, dear. Gune? Rabies. Feb-what?? We always did a January cake as there were about 8 birthdays that month. Never added names, other than the last name.. "this way to the Smith family birthday celebration" kind of thing. Forget mentioning individual names or the month! Somehow, I find the supermarket wrecks with all their mistakes in spelling are classier than the bake shop ones, but maybe that's due to the enormity of the wreck on a wedding cake level? As always - great puns/references. The last cake reminds me of a street performer we saw in Hawaii last year. He was called Basketball Man and kept calling out to "Everbody." The last cake reminds me of Dr. Nick from the Simpsons! Hey Everbody, who wants cake? I think Scooby Doo must have called in the inscription for the Rirthday Rabies cake! Loved your post. A great send up of our legal eagles. Have you been a lawyer in a past life? No? Perhaps a bean counter? -And the cakes were a riot, too. Obviously, Scooby Doo made the "rabies" cake. But people actually DO order cakes that say "Happy July Birthdays" or "Happy Birthday July & August"! The classiest monthly inscription I've come across is "Happy Birthday Celebrants" I do that one on a cake every month for a Toastmasters group. It's too bad you didn't have a picture of the office cake I got one year. My name was on a post-it note. These are my favorites. And your commentary? Especially pithy today! "Today, you will be visited by unnecessary sprinkles and apostrophes." "Happy Birthday April Rabies" is obviously a reminder to give your pets their spring shots. How kind. 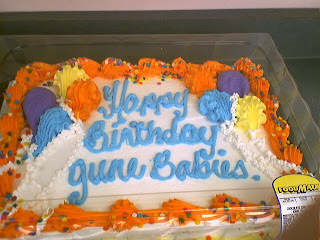 I want a cake that says "Happy Birthday April Rabies" -- even though my birthday is in September. Gune Babies is just one letter away from Dune Babies, the latest posthumous book from Frank Herbert. On the "April Rabies" cake, I strangly heard the voice of Astro, the Jetson's dog, while reading the inscription ! BTW, I really enjoyed the divine geekiness and Nerd fun of your photos of the Star Wars Convention on your other blog since I couldn't attend in person ! How timely-- just today I was looking forward to our office birthday party, when my birthday would have been celebrated. Instead our HR lady decided she didn't give a crap anymore and in lieu of cake and a party she deposited a couple dozen bagels in the kitchen and sent out an email. So at least these people did get actual cake . . . I do have to say the very last cake - "Everbody" - well, it looks like they recognized their spelling error, made a pathetic attempt to squeeze in a "y" only to say "f" it, I don't give a sift*. I had a dream last night that I got a wreck. It said something like "happy 26th and 9th birthday." I kept thinking the first one said "gene babies." Hahahaha--a great post. One of my new favorites. My WV for today would have been more appropriate for yesterday's post, but here it is anyway: dinglier. How about: Could these wreckerators get any dinglier than this? I am deeply disappointed that I got cupcakes with sprinkles for my birthday--not a CCC wreck (patooie), but real cupcakes. And the sprinkles looked like little sharks. Just the right amount of icing, good taste, pretty color; basically all the wrong things when you are looking for a wreck. 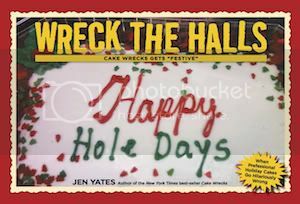 Ah well, maybe next year my cake will be dinglier. If April showers bring May flowers, then April rabies must bring May babies. I think the Rirthday Rabies cake was decorated by Scooby Doo. When we had the monthly birthday party at a nursing home for the residents, the baker just made a huge sheet cake that said simply "Happy Birthday." They still got recognition without the embarrassment. We used to have someone who ordered cake for all the birthdays. I think some of them were the generic "Happy Birthday April babies" type. Some had no writing at all. None were wrecks, fortunately - they all looked and tasted great. She even tried to rotate through several types to pick up most of the favorites. I think she eventually tired of doing it, because probably half of the people never acknowledged the time it took to order and pick up the cake every month. Until you pointed out that poorly drawn capital J, I thought the wreckorater had simply spelled Grune wrong. Thank you for always making me laugh, especially after an annoying day at work! What a coincidence, I just got invited to an inter-departmental "Jul-Aug-Sept birthdays potluck" for next week. They aren't even buying us cake! I work in a grocery store bakery, and we actually have a lady who comes in every month and orders a cake. (I think she works in a nursing home.) Usually it will say something like, "Happy June Birthdays! or she'll just go with the classic: Happy Birthday! Can't seem to go wrong with that one! It's APRIL RABIES! A debilitating, agonizing disease with no known cure! Its hapless victims foam at the mouth as they are overcome with the urge to pick daffodils, garden, and go outdoors. Lol.. poor April babies. Now their coworkers will think it is rabies month and call in sick. As for that Virgo cake.. wow don't even need 3-D to see how scary that cake is.. lol evil evil bakers. I understand. I really do. Months and star signs make a great cover when otherwise confused or unsure. Looking at someone's file or admitting your mistake is out of the question. Asking another co-worker doesn't work either. So let's just catagorise everyone by month, star sign and (if you're game enough) birth DAY! Help! Some of these look like something Pointy-Haired Boss would have had Alice order. #3 Going by the 'groovy' frosting, I'm guessing the wreckerator's other gig is tile setter. Tile setters use a special toothed trowel that puts grooves in the mastic so that... never mind. #5 I'm surprised the words 'rush job' didn't find their way from the order form onto the cake. But then, that would have taken extra time. Why not just give 'everbody' a mini blank cake and a tube of gel icing? Or -- cheaper and easier still -- take a picture of a blank cake, make copies of the picture and hand them out with marking pens. Be sure to recycle the paper and collect the pens at the end of the exercise. wv: shadst. In future, thou shadst do a better job of concealing thy indifference toward thy fellows. Hehehe. "Happy birthday, people.. or whatever.. look, we just wanted cake, so we got this under the guise of celebrating folks who happened to be born in the month during which our craving struck." Too bad that wouldn't fit on the cake! wv: ovite... You're all ovited over for cake! 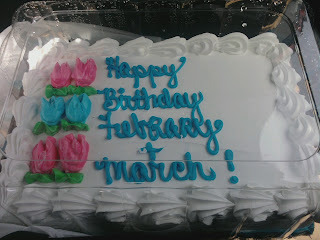 I'm amused by the doubled-up sets of flowers on the "Febrary & March" cake. Was that deliberate? Each month gets their own column of flowers? WV word = "dismsin", as in what the bosses of these wreckorators should be doing to them. You know, they could have used that April Rabies cake at the Michael Scott Dunder Mifflin Scranton Meredith Palmer Memorial Celebrity Rabies Awareness Pro Am Fun Run Race For The Cure. Made me LOL! Woke my sleeping daughter up! I hear Scooby Doo reading the inscription on that chocolate cake! and the Happy Birlday Everbody is for the boss who wants only ONE extended lunch for cake a year! not one a month, or one a week! Hmm, didn't know that rabies had a birthday, sweet. Just when was rabies actually born?